How about pink flamingo mantel decor….something new and different? I gave it a go and guess what….. I love my new mantel display. Is it okay for me to say that? Sometimes I change my décor and it looks okay, But the Pink Flamingo Mantel…..I really like it. I sit on the couch (seems I do a lot of that lately) and I keep glancing at the mantel. Every time I look at it I smile. That’s good, right? I’ve been trying to decide the theme of the Fall mantel for a few weeks now. I would go back and forth with do I want a neutral color scheme, meaning mostly white. Or do I want the typical Fall orange color scheme. 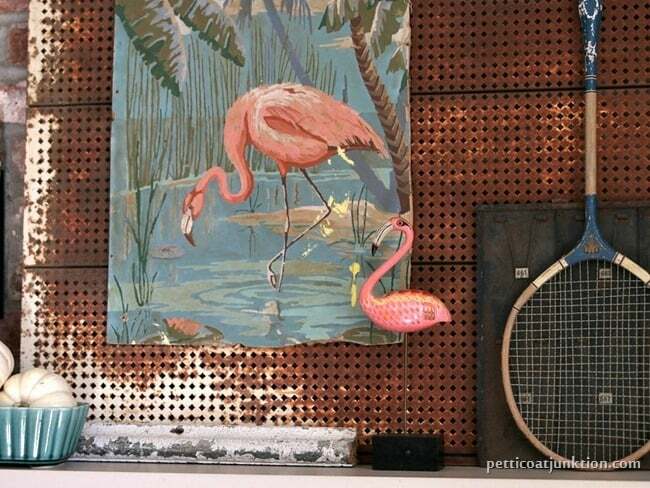 The Pink Flamingo painted piece is one I pulled from the garbage can at the shop where I have my booth. The lady who tossed it just wanted the frame. She kindly gave me the painting. You can see it’s torn around the edges and has splashes of yellow paint in places. I didn’t care. I loved it on sight. It has been on the top shelf of the workshop, just sitting there so I can look at it. Well, I looked at it this week and had that ah-hah moment. I used some 3M magic hangy things of some type….will have to look at the name for you…and stuck the painting to the rusty thing that I’m also in love with. Then I had to decide what else I had that would highlight the Flamingo. Not much. the rusty metal receipt holder, the pair of white cabinet doors, and the dried flowers are thing I already had. I went shopping at the Southern Guthrie Flea Market and picked up the greenish planter for 50 cents, the velvet pumpkin for $4.95, the pink Flamingo on the stand for $1, and the tennis racket for $2. The blue pumpkin and the two small white ones were $3 from the local market. So for around $11 I decorated my mantel. Awesome. I couldn’t believe it when I spotted the Flamingo on the stand. It was just too perfect. I call this project, decorating on a budget. It doesn’t have to be expensive to be NICE. Most times I just shop my home or workshop for things to put on the mantel. It works. 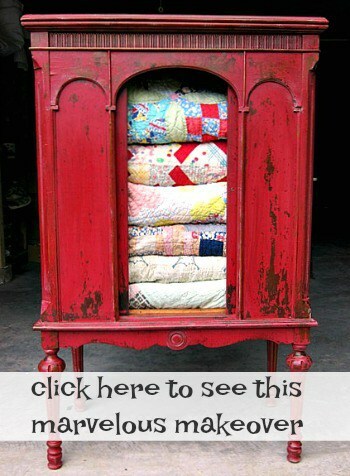 Click here to see …..Mantel Decorating Made Easy. Click here to see……Latex Paint For Furniture, Yes! I absolutely love the warm subdued look of the display. What do you guys think of my mantel? You can be honest. I love hearing your thoughts and opinions. 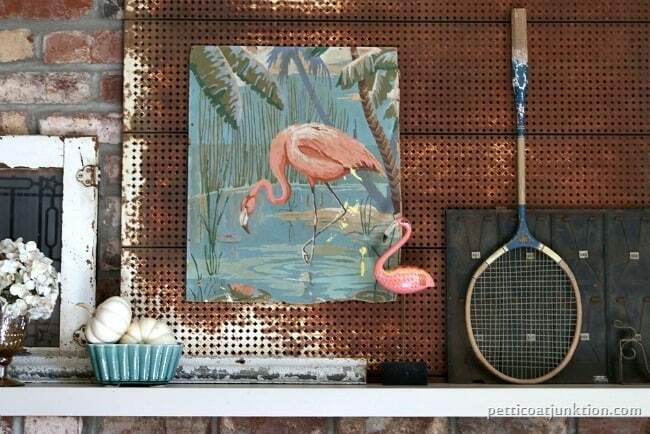 I love flamingos and I am truly in love with your mantel! So so cute! 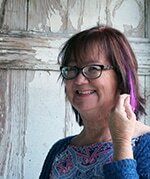 I love flamingoes, I can’t believe you found that one on a stand for just $1 – fantastic! The whole things looks beautiful. I think flamingos will be the new owls! I’ve been seeing them all over lately, and I love it. That painting is too cute and I really like how it stands out on your mantel. BTW that “rusty thing” as the backdrop is perfect! 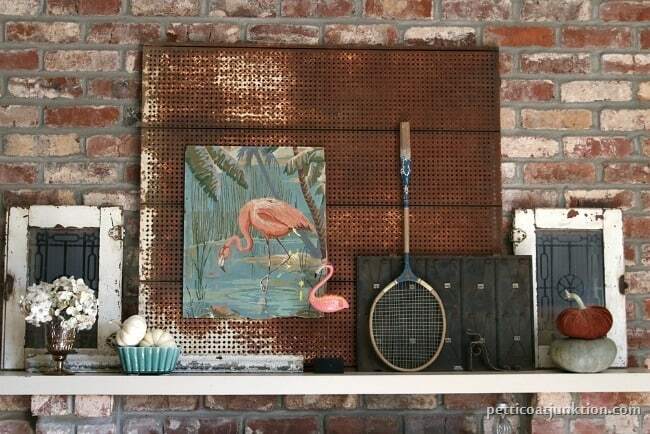 Love your pink flamingo mantel. You can never have too many flamingos!! Love it! I absolutely love it too! Good for you for rescuing the flamingo painting!